Greetings y'all! A few weeks ago a friend of mine at Mercy Ships Ministries' headquarters in Garden Valley, Texas mentioned to me about their need for some volunteer help on some electrical/technical projects aboard their hospital ship, the m/v Anastasis while it's in shipyard in Cadiz, Spain. I thought about it and prayed about it and things began coming together. In talking with my pastor, the possibility came up of me hopping over to Romania to visit our missionaries there. Before I knew it plans were underway and I had booked the plane tickets. As I write this (still in Texas) the plans are for me to help with the installation of some security cameras aboard the ship, apparently a new law that they're having to abide by, due to the world of terrorism we live in. This project will involve running coax cable throughout parts of the ship and installing cameras in key areas. I'll probably be helping out with other electrical projects while I'm there too. It was been exactly ten years since I last served aboard the Anastasis. For the whole summer of 1993 I served in the computer department on the ship while it was in northern Europe, Scandinavia and the Baltic region. That tour included two weeks in Lithuania, and I also spent a little time in Latvia as well. 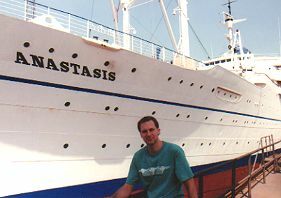 The previous year I spent two months aboard the Anastasis, where I worked on their antiquated phone system while the ship was in Holland and Germany. A decade later, I'm looking forward to hooking up with Mercy Ships once again. On or about August 22nd, we'll set sail for Rotterdam, Holland, arriving on or about the 26th. My plans are to leave the ship when we arrive and visit some dear friends in Holland, the Hempenius family in Rotterdam and the Smit family to the east. On Saturday morning, Aug. 30th I'm scheduled to fly from Amsterdam to Budapest, Hungary (via London). Cristian and Amy Ciortea will pick me up there and take me to Cluj-Napoca, Romania where they live and minister to street children at King's Love ministry. I'll be representing my church (Community Christian Fellowship) on this leg of the trip, checking out Cristian and Amy's work, finding out how we can better support them, pray for them, etc. I'm scheduled to fly back to London on Sept. 6th, stay there with friends a few days and depart for Dallas/Ft.Worth on 9/11. I'd be really grateful for your prayers for me during this month-long mission trip. Healthwise, I'm feeling fine, but I'd appreciate your prays for strength and endurance, continued good health, and travel safety. I should be able to retrieve my email while I'm in Western & Eastern Europe.